Here you go, the entire playlist of all 18 hours (Fred passed out early) of the 24 hour live stream. We want to thank everyone who donated, joined us, and have ever enjoyed any of the content from Gaming History 101. Below is the playlist in order starting with the first video, but you can also click this link to go directly to the list and pick your favorite video. Please note: Due to a copyright claim involving the music in a certain video, our Shadows of the Empire stream has been taken down. We tried to remove the Hoth theme from the video but it ended up with a video that was only 4 minutes long and you couldn’t make sense of it. It is possible to view this stream for a short time on our Twitch channel. The Sega Master System how I do love this 8 bit system. You know poor Sega never got Castlevania until the Mega Drive/Genesis so it was up developer SIMS (Soft development Innovation Multi Success) to fill that void. How this developer is still going to this day I don’t know, but I’m going to boldly state that Master of Darkenss is the best game this company developed. Other honourable mentions include the Dreamcast port of House of the Dead 2 and the best fishing game ever, Sega Bass Fishing on the Dreamcast and later the Wii. 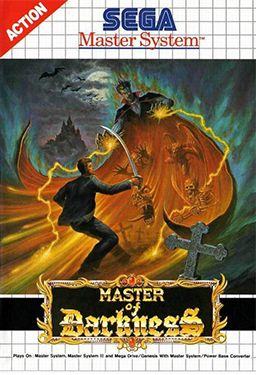 Now before you Americans shout at me and say, “its actually called Vampire: Master of Darkness,” I will politely remind you that in Europe the “Vampire” part was removed. Maybe because of censorship, similar to how Ninja Gaiden turned into Shadow Warrior, but this is not always clear. Vampires were scary guys in the 90s (so were ninjas for that matter). In Japan this game was In the Wake of Vampire and it also came out on Game Gear.